A rendering for the version proposed last year. 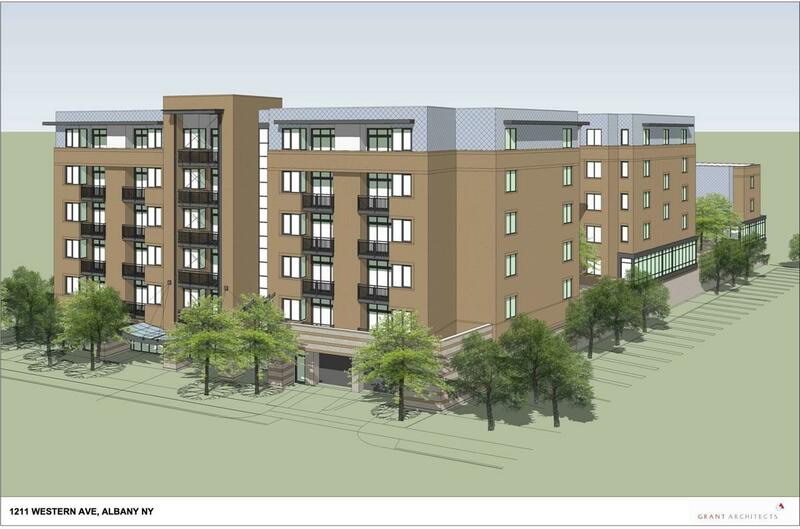 Last November, GSX Ventures -- a Maryland-based company -- appeared before the Albany planning board with a proposal to build a six-story private dorm with 118 apartments and 327 beds. 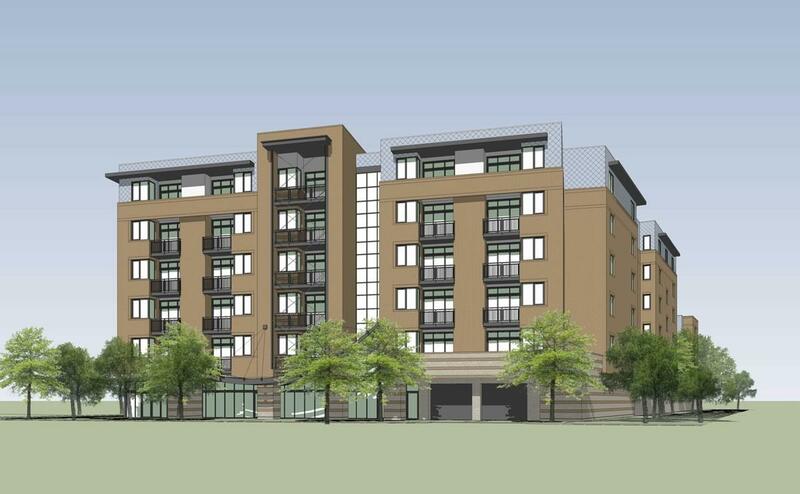 (GSX has also been involved with the development of the Aspen on Washington Ave and the still-under-construction Auden private dorm just east of the Aspen.) To make room for the project at 1211 Western Ave, the existing 12,000-square-foot office building there would be demolished. A group of neighborhood residents -- particularly from the adjacent Tudor Road -- showed up to voice their concerns about scale, traffic, the presence of student housing, and what they predicted would be a negative effect on property values. The project was scheduled to re-appear before the board at its February meeting, but the developers pulled it from the agenda. There are renderings for the new plan a the top in large format -- click or scroll all the way up. + Five floors of apartments atop two levels of parking (one of them underground). + 137 apartments with a total of 273 bedrooms. + Apartments would be a mix of 1BR, 2BR, and 3BR. + On-site parking would include roughly 115 spaces. + The ground floor would include an approximately 1,400 square foot retail/office space next to the sales office. "I thought it was a an out-of-sight place for the project," said GSX's Jon Grant this week via phone, explaining why the company decided to propose another plan for the site. He pointed to nearby shopping and restaurants. And: "What better place to be than close to a university." Grant said the key conceptual difference in the new project is that the units would be rented by the apartment -- not by the bedroom as they are in the private dorm buildings. The rooms will also be bigger, there will be more closet space, and the finishes will be different. The building will still have clubhouse space, outdoor courtyards, and a fitness center. The company envisions that the apartments will be attractive to younger adults as well as older people who don't want to deal with the maintenance on a home but want to stay in the neighborhood. Grant said the building will be clad in brick and the architecture will be attractive. "It's just not a good fit for the neighborhood," said Tom Hoey via phone. He's the Common Council member who represents this part of the city. Hoey spoke against the project when it was before the planning board last fall as a council member elect. And he said this week that the new project looks a lot like the old project. "Same pig with a different shade of lipstick," Hoey said, recalling what one of his constituents remarked at a neighborhood meeting. He figures that residents of the new project would still largely be students. The council member said his main concern is that the project is too tall and too dense for the site, especially because of its proximity to the single-family homes on nearby Tudor Road. He said he had suggested during a meeting with the developer and other local officials earlier this year that the they consider building condos there instead. We asked GSX's Jon Grant about neighborhood concerns about the size of the project. 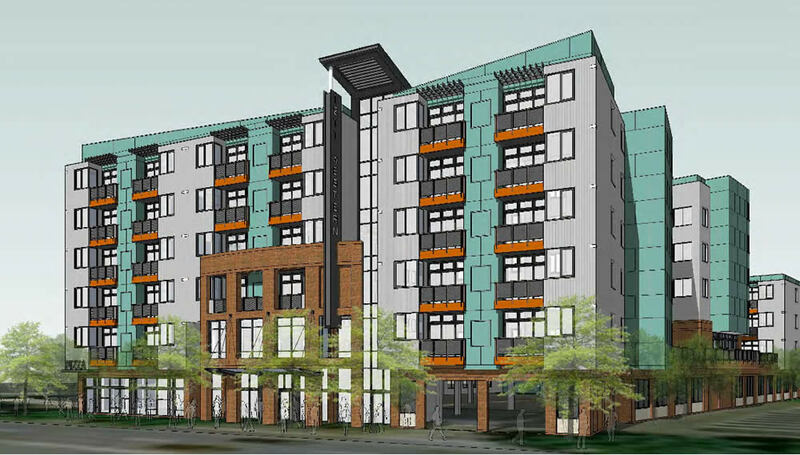 "A six-story building is not a taller building, it's mid-rise," Grant said, noting the project fits the zoning for the site and trees would help separate it from the adjacent residential street. "It is in the city and cities do have apartment buildings." The situation surrounding this proposal touches on a topic that applies not just in Albany, but in cities all around the country: To what extent should people in a neighborhood have a say over what gets built there? And who should get the decide the fate of a project when it could possibly benefit a city overall -- in the form of new housing or additional tax revenue, for example -- but could also cause some negative local impacts in a neighborhood? Hoey said he believes that people in the neighborhood should have a say, if only for the fact that they'll be living there after the developer moves on to another city and another project. This project is on the draft agenda for the May 17 Albany planning board meeting at 5:45 pm at 200 Henry Johnson Blvd. And it was the subject of discussion during the planning board workshop this past Monday. It sounded like members will have questions about issues such as height, the configuration of the building on the site, and how construction might work up against the busy Western Ave corridor. Planning board meetings include public comment time for each project. Speakers get three minutes each and need to sign up at the start of the meeting. There is another recent AOA piece where all of the comments are complaining about the high cost of housing in a new Troy bldg and in the area in general. If we want housing prices to go down we need to increase supply - it's the only way. Let's stop getting in the way of building apartment bldgs that will lower housing costs for everybody. Do people ever think development will increase their own property values? Golly, it's almost as if residents of middle class white neighborhoods get listened to. This is a bad idea for completely different reasons. That site is an office building now, surrounded by commercial properties serving the university and neighborhood. High density housing there isn't necessarily a terrible idea *for that site*. However, why in the hell would the city ever support this? Albany is FULL of hundreds of properties that are vacant and waiting for redevelopment/rehabbing. Not to mention the hellhole that is lower Hudson ave - all of those students and maybe their landlords should be fined heavily. Build the city's tax base and neighborhoods by rebuilding those old buildings and rebuild our neighborhoods. NIMBY-ism at it's finest. Density is a good thing! The one thing that really sticks out to me is the 115 parking spots for 237 beds and retail and offices. It's still geared to students who may or may not have a car per person but the fact that there's less than one parking spot per apartment is troubling. There really is very little on street parking available for a building of this size. Argus - remember that cost of construction is not negligible. Or putting things in perspective - these new projects are NOT recovering their true costs as they need extensive PILOT agreements. Moreover, I am not sure if taxes coming from these do cover incremental government expenses - especially during the period these developments are new and have highest value for residents - who must have higher income to live in those. Especially true regarding the cost of running public school system - which is about $5k/year per working age NYS resident. Looks like a good idea, but they must make sure that the ground-floor parking garage is not ugly and pedestrian/urbanism unfriendly like the Aspen's is on Washington Avenue. Unlike the Sandidge Road project off of Fuller Road, which is an actual incursion into an existing residential area, which replaces widely spaced single family homes with multi unit buildings and parking lots, this Western Ave project is a replacement of an older commercial building with a new commercial/residential building CONSISTENT with zoning and the character of Western Ave.
JSC: "...slow the steady population and tax base decline Albany has experienced over the last 25 years.."
Albany's population is on the upswing. I agree the tax base hit a critical point two generations ago and hasn't begun to be solved. If only we had a local political system that responded to our incredible, crazy tax problem. >Albany's population is on the upswing. Call Census with those news since they report otherwise. Aha, whooping 3% while US grew almost 10% over same period. And estimates (yes, those are just estimates) show little to no growth since 2010. Which is, of course, still better than what is going on in other upstate cities..
OK Mike....you claimed the census data would show no increase; I cited their data to show you were wrong; now you dismiss the very data you brought into the conversation. Current estimates are higher still. But I won't bother you with that since you aren't actually interested. Mike has a point. If everyone starts with 10 cookies, and you are given 3 more cookies and everyone else is given 5 more cookies, you're lagging even though technically you now have more cookies. In this example I would have zero cookies because I would eat them all. Though I'm not sure local metro population change should be compared to national trends. New York is a stable, mature economy while many of the areas that are growing are younger and experiencing growth for reasons such as massive tax breaks. That kind of growth is unsustainable, so it's important to look at the big picture. This is all superficial to the discussion though, as Albany is somewhat of an outlier being a state capitol with a high number of schools and other untaxed institutions within its border. Few cities struggle with the tax burden placed on private property owners like Albany does. That should be the core of the discussion with these developments. -B - Since you mentioned tax breaks as an unsustainable practice, it would be good to recall we're in "another apartment complex" post and talk PILOT..
And I would say that Albany would be way worse overall without all those damn tax-exempt organizations.. I for one am glad the population in this region is not increasing massively. Look at the areas of the country where this is occurring and you have total traffic gridlock, inflated home prices, massive sprawl, over-crowded and under-funded schools, etc. I am glad we are not Orlando or Phoenix. Those snow birds can have their air-conditioned compounds. "Few cities struggle with the tax burden placed on private property owners like Albany does. That should be the core of the discussion with these developments." I want to see private development done in a way that capitalizes on what Albany has - or perhaps could have. We've got block after block of beautiful old buildings that could be rehabbed. Doing that work won't be cheap but it could be done in ways that could build our tax base and other aspects of our local economy while keeping Albany very livable. The growth in population in places like our old warehouse neighborhoods ( I cannot believe I am even writing that) shows that rehabs are desirable. Just let them build it. A few upper middle class, uptight and over privileged homeowners should not be able to control development in uptown Albany.